I realized earlier this week that we haven’t done any cooking on the wok lately. When we first got our wok from The Ceramic Grill Store, we used it quite a bit, but it kinda died out for awhile. Not sure why. I decided to fix that, so I went looking in our pantry and fridge and freezer to see what we had on hand and what we could make. I always love it when you find that you have everything you need and a cook isn’t going to require a trip to the store! Sure does make life easier. 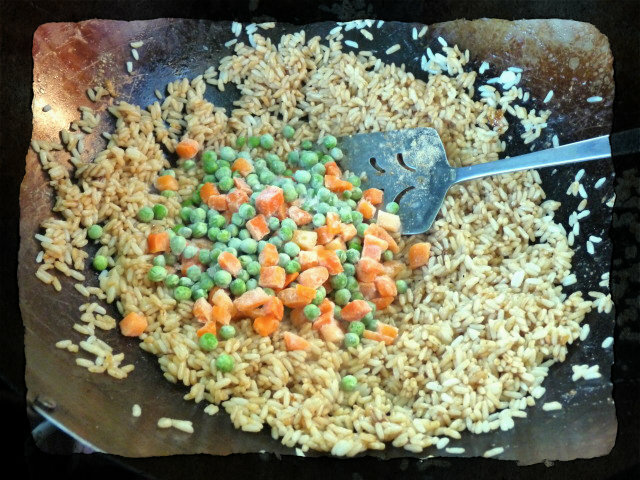 You might be wondering why I call this Easy Fried Rice. See that lil yellow packet at the bottom of the picture? Yeah, I cheated, I used a store bought packet. This one is not from scratch. Sorry. Sometimes you just gotta go easy. Plus I have used this before and gotten pretty good results. Is it the best? Maybe not…but it still blows away the delivery guys around here. Anyway, that seasoning is from Sun Bird and you should be able to find it at your local grocery store. 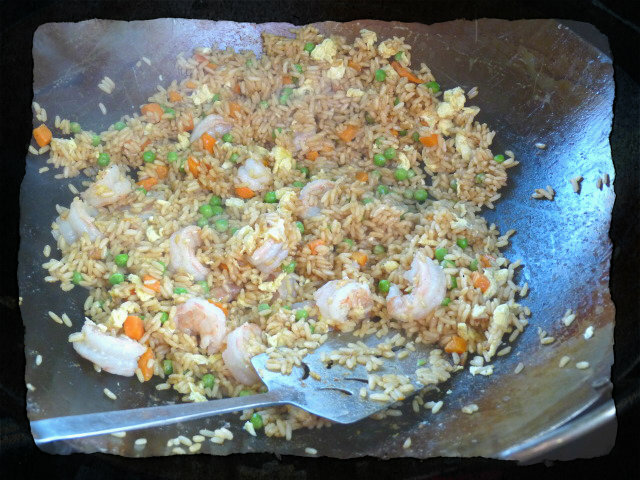 One of the tricks I have picked up for fried rice….cook the rice the day before. That’s right. the day before. You do not want to use fresh rice. Then leave the rice uncovered in the fridge overnight. It might seem like a pain to do this one lil step, but trust me….it makes all the difference in the world. 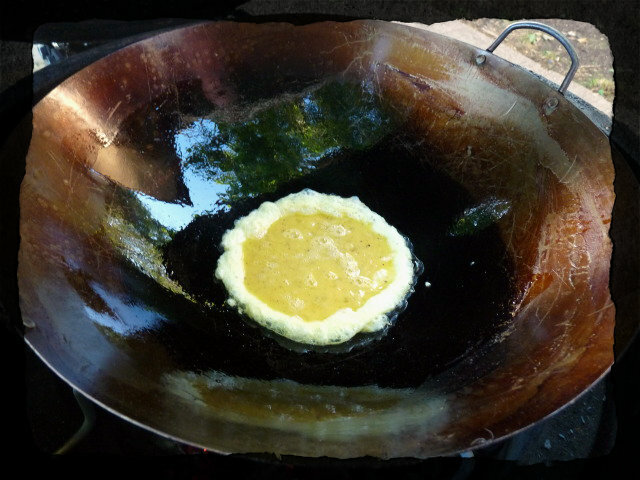 For this cook, we set up our Egg at 550F, with our spider (holder for the wok) in legs down. We did not follow the step directly from the back of the package, so if you are going to cook this inside on your stove, I suggest you do not follow what we did, but just go by the package and you will be fine. 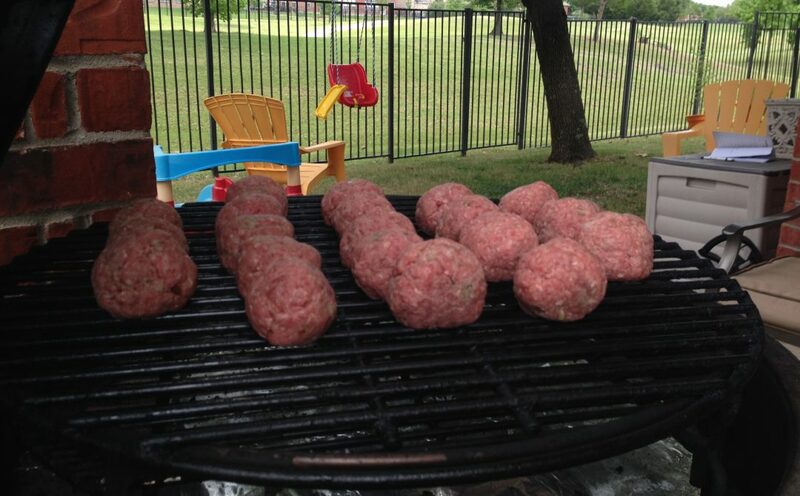 If you have an Egg or other Kamado style grill, you can follow along. 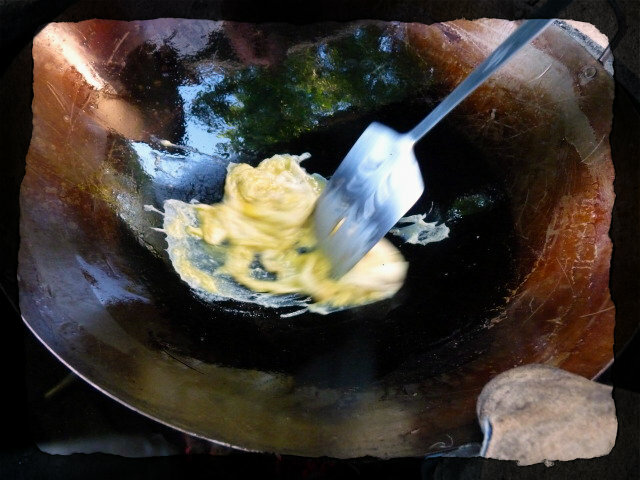 First up, we scrambled our eggs in the wok. I thought this picture turned out pretty good. It was cool how the eggs reacted when they hit the hot peanut oil in the wok. Give the eggs a few seconds to start to set up, and then begin scrambling them. This part is going to go super fast, so make sure you have a bowl handy to move them to once they are done. Once the eggs are done, its time to move on to the meat. 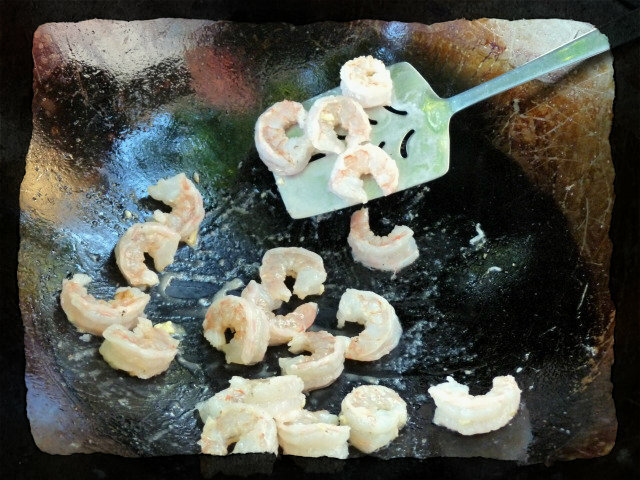 You could easily use chicken or beef or pork, but tonight we opted for shrimp, as its what we had on hand. You only want to cook the shrimp about 80% at this point. They are going to be added back to the rice later to finish cooking and you don’t want to end up with overdone, rubbery shrimp. 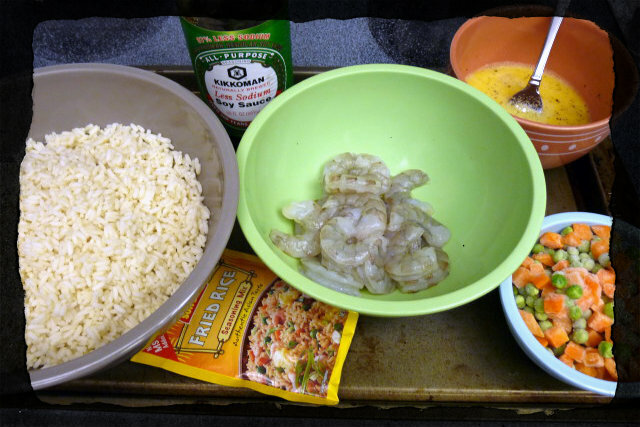 The next step is to add your rice to the wok along with your seasoning packet and about 2 tsp of soy sauce. We use the low sodium soy sauce, but if regular soy sauce is your thing, go for it. 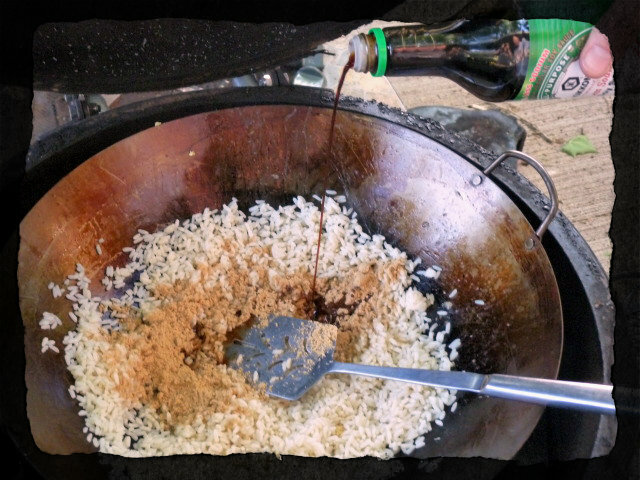 Stir the rice until the seasoning and soy sauce are evenly mixed in. 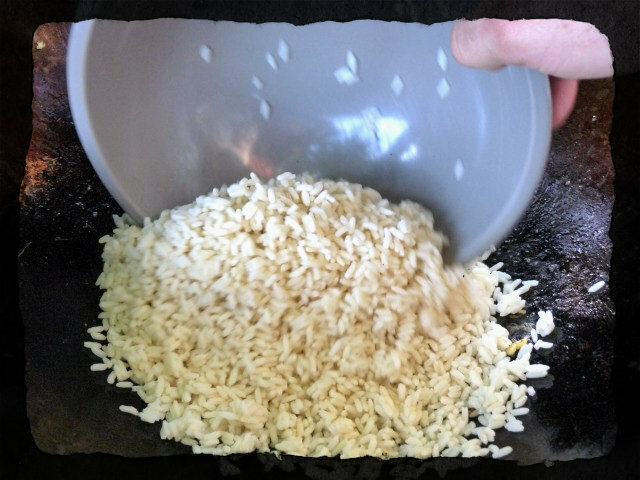 Once they are evenly distributed, allow the rice to sit for a while. This isn’t like regular stir fry where you are constantly moving the ingredients around. You want the rice to have contact with the hot surface of the wok so it will cook properly. Next stir in one cup of frozen peas and carrots. Allow the rice mixture to heat up for a few more minutes. 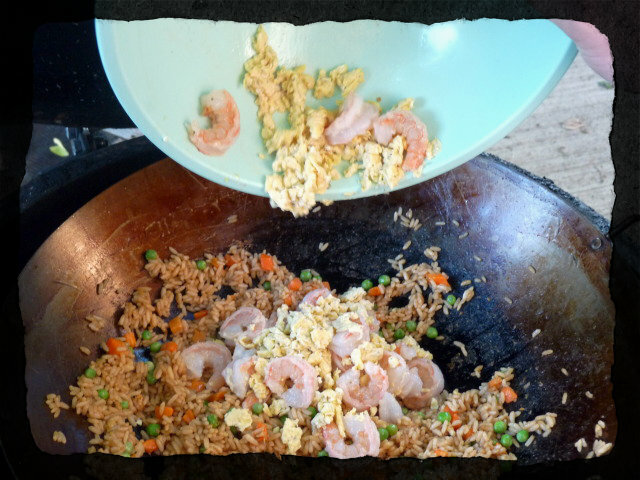 After the rice mixture had begun to heat up, add the shrimp and eggs back to the wok and stir to mix evenly. 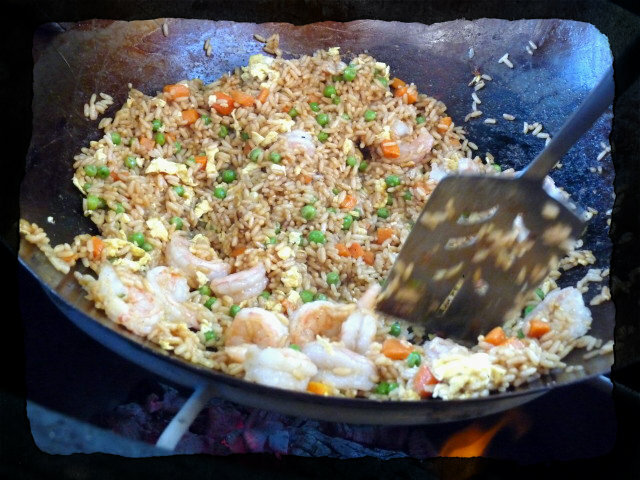 Allow the fried rice to continue heating up, stirring occasionally. Keep an eye on the shrimp. You do not want to overcook them. When the shrimp have turned pink they are done. Remove the wok from the heat and plate up. This was a fast cook and a fun cook. I did learn two things. One…make sure to have egg rolls on hand. I thought when I checked that we had some. Sure would have been nice to go along with this cook. And two…Mrs. G is a better photographer than I am. Yep…Mrs. G took all those pictures!! Well, except for the mise en place, you can blame that one on me. She even did the final plating! So from now on, I’m gonna hand over the camera to her and I’ll just stick to cooking. I hope this inspires you to ignore the phone the next time you are craving some fried rice, pass on the delivery and cook you own. It’s so much more rewarding to cook it yourself and it’s not that hard. Just wish I had gotten a fortune cookie…. Next: Next post: No, It’s Not Delivery and It’s Not DiGiorno Either! I wish I had known you were in Texas last week, maybe we could have gotten together. What part? I’ll be back in Houston the last week ‘o May…you far away? Dallas. A few hours away, I think. Gawd, this looks good. I’ve never had the “packet”, but I’m thinking that I’m going to be needing to add it to the list for next week. NOM. I’m sure there are hundreds of recipes floating around the internet on how to do it from scratch, but to tell you the truth, the packet is pretty good. And it has no MSGs, so that’s nice. I’ll probably just stick to using that. Will be back in Houston at the end of the month…does that work? Probably not. We’ve got a camping trip scheduled already. Bummer. Fried rice is my lifesaver. (Almost) always have it in my freezer, just in case my family needs something to eat quick. Up until this year, it wasn’t something I ever really ate. Yeah, I ate it with whatever chinese food I ordered, but I never ordered it as an entree with some type of meat involved. Now I can’t get enough of it. 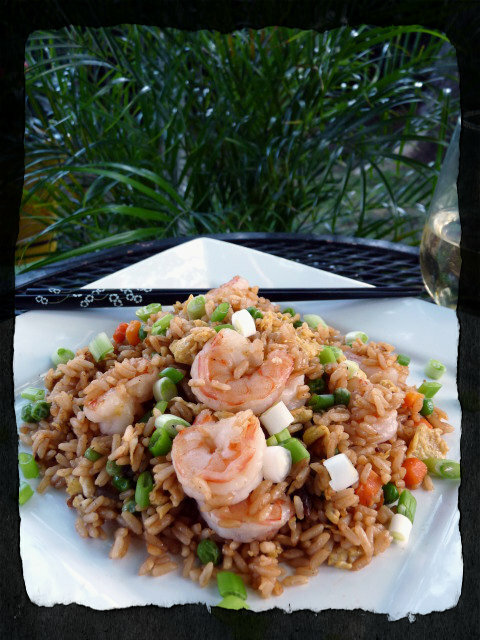 Looks like terrific fried rice! Thank you, Karen. It was pretty tasty. Ms G did do a great job on that last shot. I wish wish wish, I could hand that aspect over to Alexis (food styling/photography). I need to give Tom at CGS a call, I’m ready to get an adjustable rig set up. She is taking over the camera work now. She did the pizzas and the fried shrimp. She’s just better than me at it. Call Tom. His products are amazing. I don’t have an adjustable rig…yet, just the wok and spider, but I love ’em. This is beautiful. There is one thing missing, however … I see the wine in the final photo, but where is the Johnny Walker Double Black in the prep stage? By the way, have you seen the June issue of Food & Wine? That was Mrs. G’s wine. I was actually drinking some Cuba Libres (out of bourbon, bummer) I have not seen it. Any good? It’s totally true sometimes you just gotta go easy! Looks so tasty none the less! Easy but still so tasty. Thanks for taking the time to check it out. I prefer the packaged seasoning for stir fry’s as well. Its quick easy and that brand really does taste good. 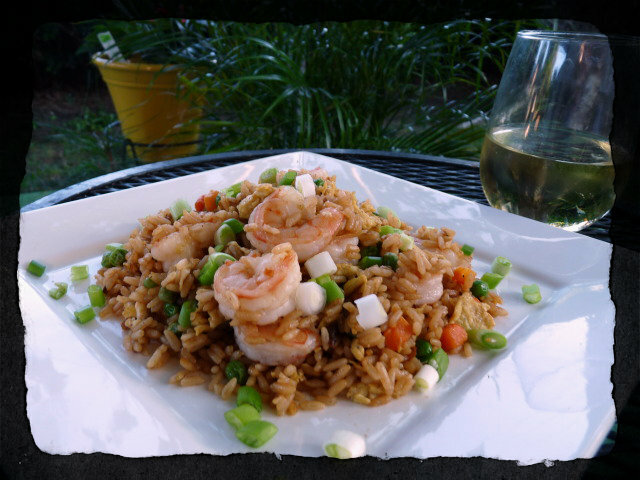 The shrimp in the stir fry makes this dish perfect. thanks for sharing.